BLANTYRE, Malawi — Malawi has known rule by Britain and by a mercurial dictator. Over the last few days, however, it wasn’t clear who was leading this impoverished southern African country, as doctors disclosed Malawi’s President Bingu wa Mutharika had died but the government insisted he was only ill. 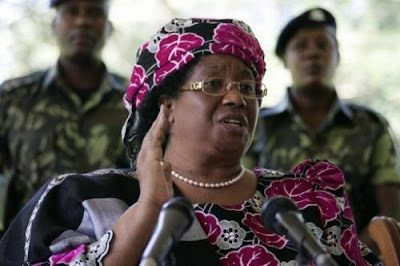 In the end, Joyce Banda, who had held onto her post of vice president despite falling out with Mutharika, was sworn in on Saturday in a brief ceremony in Lilongwe, the capital. Earlier Saturday, she presided over a Cabinet meeting and held a news conference at which she was flanked by Cabinet ministers, the army commander, national police chief. The Malawi government only confirmed the president’s death on Saturday, two days after the leader of the impoverished southern African country died and a day after it was announced by doctors. The delay in announcing Mutharika’s death and allowing Banda to step in led to speculation politicians were squabbling over succession. Banda may have to contend with powerful enemies at home as she tries to lead her country out of economic crisis and repair relations with international donors with whom Mutharika had clashed. Gift Mwakhawa, president of the Law Society of Malawi, is convinced some members of Cabinet tried to stop Banda from taking over, even though Malawi’s constitution makes it clear power should pass to the vice president if the president dies. “Most Malawians wanted the constitution to prevail. The security forces wanted the constitution to prevail. And the constitution has prevailed,” Mwakhawa said in an interview. Under the constitution, Banda will serve out Mutharika’s term, which ends in early 2014. Mutharika first won office in 2004, and was re-elected in 2009. Doctors, who spoke on condition of anonymity because they were not authorized to speak to reporters, said the 78-year-old Mutharika died Thursday, before his body was flown to South Africa. Taking the body to South Africa was apparently done to buy time for politicians to work out a succession plan. Local and international media had carried reports of his death since Thursday, and Malawians had furiously discussed it among themselves and on social media platforms. When Mutharika first came to power, he was backed by his predecessor, Bakili Muluzi. A feud ensued after Mutharika had Muluzi charged with corruption and fraud. Mutharika left the ruling party to establish his own. Political bickering between the two men led to extensive legislative delays, rioting, a failed impeachment bid, and accusations of coup and assassination plots. John Kapito, chairman of the Malawi Human Rights Commission, said more bickering could lie ahead. Men who had gained power under Mutharika may not give it up without a political fight. Among them is Mutharika’s brother, Foreign Affairs Minister Peter Arthur Mutharika. President Mutharika had favored his brother after clashing with Banda, naming him as acting president when he traveled. The president did not have time to consolidate the succession before his heart attack, an event that took many by surprise. The late president’s party named his brother as its president on Friday, though it did not then confirm the president had died. “She will be tested,” Kapito said of Malawi’s first female president. Banda, 62, takes over a country in which shortages of sugar, fuel and other commodities have created long, restive lines at shops and service stations. Mutharika, a former World Bank official once heralded for his economic stewardship, had in recent years been accused of mismanagement and of trampling on human rights. Anti-government demonstrations across Malawi last year were met with an unprecedented security crackdown that resulted in at least 19 deaths. Last month, a U.S. aid agency that rewards good governance suspended $350 million worth of assistance to Malawi. The International Monetary Fund describes its program with Malawi as “off-track.” Mutharika had ignored IMF advice to devalue the country’s currency. Kapito, the human rights activists, said he hoped Malawians and foreign donors will rally around Banda, wife of a retired chief justice. “Life President” Hastings Kamuzu Banda led Malawi to independence from Britain, only to impose an oppressive rule from 1963 to 1994. Whims that reflected his puritanical streak were law. The U.S.-trained physician and former Presbyterian church elder always attired in a dark suit and Homburg hat, banned women from wearing pants and short skirts, and banned long hair on men. Joyce Banda, who is not related to the dictator, recently joined protest marches in this still conservative country in support of women’s right to dress as they please. Hastings Kamuzu Banda lost power in the country’s first multiparty election in 1994 and died three years later. It's a pity how power changes human beings. In just a few years, Muntharika spoiled his hard earned work in this world for nothing other than losing the hard earned respect and popularity. Wishing you the best Your Excellency Joyce Banda. I hope you will rule Malawi with dignity and when the time comes, leave the post with the samme dignity as you have today. family, friends, inlaws and neighbours will expect favours from you, keep a distance to nepotism! you have the force of God with you right now, keep doing right, and all will be well.